"This is the second town in size in Lafayette County. In stirring business push and enterprise, it ranks second to none. Located centrally, in one of Missouri's "river counties," which, in the Western part of the State particularly, ranks with any other part of the world in richness of soil, and productiveness of agricultural and fruit crops; it is specially favored as to situation. About it, fruit trees blow into flower, and are weighed down with fruit. Mines furnish coal for the furnaces of the vast manufactories so certainly destined to come here. The prairies bring forth cereals in abundance, and the sound of the reaper is heard in the land—that land whose requirements of tillage form a large sale each year for agricultural implements. Higginsville is fifty-five miles East of Kansas City, at the junction of the Chicago & Alton, and Missouri Pacific Railroads. It was founded in 1869 and named after Harvey J. Higgins, when the Lexington & Sedalia Railroad, now a link in the main line of the Missouri Pacific, was built. It got a postoffice in 1870, with Mr. A.B.E. Lehman as postmaster. The town was incorporated in 1876. The first mayor was Mr. Abram Wade. It was first incorporated as a city, nearly ten years later. The building of the Alton Railroad through Higginsville seemed to give the town a new lease of life, and since then, 1879, its growth has been steady and assured. Since that time the population has been more than tripled, and now numbers 3,000. Higginsville, while surrounded with a fourteen to thirty-five inch vein of splendid coal, is immediately underlaid with sandstone, which obviates any danger of sinking in, that might result from excavation. The abundant pure water supply is but another evidence that, even though unintentionally so, the location of Higginsville is an especially fortunate one. The surrounding landscape is a pleasing picture of broad river bottoms, bold rugged bluffs, wooded mounds and valleys and charming districts of high rolling prairie. With such splendid transportation facilities, such superior educational advantages, not to mention her natural resources, Higginsville has the assurance of a great future. Her past has predicted it, and her present confirms the belief in it. Already manufacturing interests have cast their fortunes in with hers to the number of fourteen or fifteen, the press is ably represented, and the professions have enthusiastic and conscientious votaries. Three banks do a good business, fourteen mining companies have been formed. Here is located the State Home for Confederate Soldiers. Lafayette County gave $5,500, leaving the net cost of the home $13,052. The management at present has only sixty acres, 300 more being leased, the home receiving one-third of the crops raised thereon. Seven ex-soldiers are now in the home, which aims to be self-sustaining. Ten cottages are under process of erection, and it is expected each county in the State will erect one. An elegant and attractive boulevard is being built from the town to the grounds. 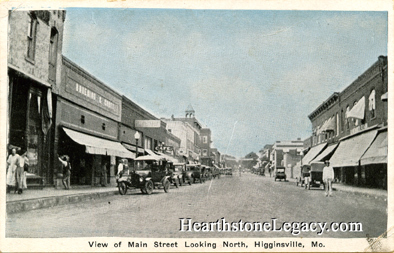 An early postcard view of Main Street Looking North, Higginsville, MO. Higginsville is in central Lafayette County, about 50 miles east of Kansas City.